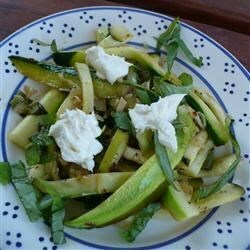 "I came up with this summer side dish when we discovered a couple of very large zucchini hiding in the garden. I sometimes add some cooked chicken to make a nice one-pan entree. If you don't like goat cheese, try subbing feta or a good Parmesan." Heat the olive oil and butter in a large skillet over medium heat until the butter melts; cook and stir the shallot until softened, about 5 minutes. Stir in the garlic and red pepper flakes; cook and stir until the garlic softens and releases its fragrance, about 3 more minutes. Pour in the chicken broth and zucchini ribbons, and cook, lightly stirring, until the chicken broth has come to a boil and the zucchini strips are cooked through but not mushy, about 4 minutes. Remove from the heat, season with salt and pepper to taste, and sprinkle with finely sliced basil leaves and crumbled goat cheese. See how to make a quick and delicious pasta side dish. I wasn't crazy about this recipe. I did have to substitute dried basil for fresh. I'm not sure how much difference it would have made to have fresh basil.